They do look good. There's a thread on the HaT site asking for suggestions for the next sets to go into the queue. These were my first choice and they have collected a medium number of votes. The big scorers though are Napoleonic Austrians, Russians and Prussian Ammo Wagons and AWI sets. No big surprises there. I have hordes of painted Celts: HaT, Caesar & Newline. All I could ever need. But......if they end up looking as good as the line drawings, I guess I'll buy some. I totally agree with carlosfaro! And I also have enough celts, but these are tempting. And four naked Asterixs!!! I'll bring in a small carp: too many swordsmen & not enough spearmen. I think the balance in this set doesn't match the historical reality. However, converting swordsmen figures to spear carriers isn't that difficult. 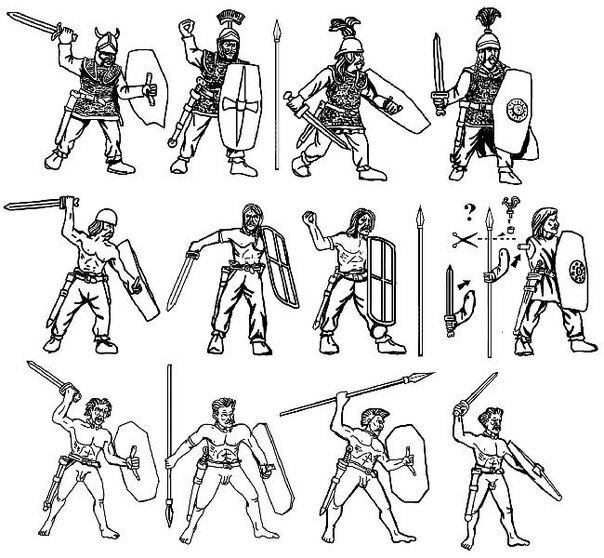 I am quite disappointed, because these are only swordmen and some spearmen. There is no light infantry at all - no bowmen, no slingers and no javelinmen. I hope for further sets. There are a multitude of celtish javelins known but not represented here. No Gaison, no tragula, no mataris. This is a pity. At least the famous gaesate shoul have their weaopon geäsum! Swords and some spears are not enough! 7.31- "At the same time that his diminished forces should be recruited, he levies a fixed quota of soldiers from each state, and defines the number and day before which he should wish them brought to the camp, and orders all the archers, of whom there was a very great number in Gaul, to be collected and sent to him." 7.81 The Gauls, after the interval of a day and after making, during that time, an immense number of hurdles, scaling-ladders, and iron hooks, silently went forth from the camp at midnight and approached the fortifications in the plain. Raising a shout suddenly, that by this intimation those who were besieged in the town might learn their arrival, they began to cast down hurdles and dislodge our men from the rampart by slings, arrows, and stones, and executed the other movements which are requisite in storming. 7.80 Caesar, having stationed his army on both sides of the fortifications, in order that, if occasion should arise, each should hold and know his own post, orders the cavalry to issue forth from the camp and commence action. There was a commanding view from the entire camp, which occupied a ridge of hills; and the minds of all the soldiers anxiously awaited the issue of the battle. The Gauls had scattered archers and light-armed infantry here and there, among their cavalry, to give relief to their retreating troops, and sustain the impetuosity of our cavalry. Several of our soldiers were unexpectedly wounded by these, and left the battle. Over the years, I have seen so many controversies (on this and other forums) concerning historical accuracy that led absolutely nowhere in the end ... So the idea to quote directly from an ancient source to settle the matter is brillant! Good answer Paul! But maybe we should distrust a little on traduction..do you have the original Latin text? It could bring more light..Antway thanks for the research and fast info! Qui Avarico expugnato refugerant, armandos vestiendosque curat; simul, ut deminutae copiae redintegrarentur, imperat certum numerum militum civitatibus, quem et quam ante diem in castra adduci velit, sagittarios que omnes, quorum erat permagnus numerus in Gallia, conquiri et ad se mitti iubet. Those who fled to him on the storming of Avaricum, to be armed and clothed; at the same time that his diminished forces should be recruited, he levies a fixed quota of soldiers from each state, in the camp of the day before which he should wish them brought, and which he orders all the archers, of whom there was a very great number in Gaul, to be collected, and to him, sent to him. Slight linguistic changes but the context remains the same but Archers , remains ..archers. Perhaps there are a few too many swords. That might not worry me too much for the armoured heavy infantry, they do look like the richer end of the Warrior elite. Re. the lack of bowmen, slingers and javelinmen, I would point out that HaT already has a Gallic set that contains archers, slingers and spear chuckers. they also reissued the Airfix Ancient Britons set that has archers, slingers and spear chuckers so they may feel they've covered these troops. But if they wanted to make another set with more of these I'd be happy to take a look. Any pictures of those Celtic javelins so we can convert. carlosfaro wrote: Good answer Paul! But maybe we should distrust a little on traduction..do you have the original Latin text? If the original Latin text says "no archers" (nul sagittarios?) then my Celtic archers are not well enough educated to be able to read the original Latin text. Ignorance is B'LISStic. I would suggest Perseus and Lacus Curtius - always the first places to look at, when you need translations of ancient (in particular, Roman) sources. I just hope it won't be three sets with 4-4 poses...either they add more poses to each, or release this as one set. ( 7,80,3) Galli inter equites raros sagittarios expeditosque levis armaturae interiecerant, qui suis cedentibus auxilio succurrerent et nostrorum equitum impetus sustinerent. ab his complures de improviso vulnerati proelio excedebant. Last edited by Paul on 18 Feb 2018, 14:28, edited 1 time in total. Paul wrote: The Gauls had scattered archers and light-armed infantry here and there, among their cavalry, to give relief to their retreating troops, and sustain the impetuosity of our cavalry. .
It´s more than likely that archery was looked down upon by the Gauls/celts who seem to have preferred Hand - to -Hand combat, especially in internicine warfare but I can imagine that, in Desperation, they would have been used..as sort of "by any means necessary" weapon..and the Roman Invasion was such a Situation. That and the Romans weren´t Gauls so not deserving of the honour of hand-to-Hand combat ? Caeser.. Bello Civili § 1:51. The whole Paragraph (below) mentions the Rutheni loosing 200 archers..something that Caeser thought worthy of mentioning? Intelligence was brought to Afranius that the great convoys, which were on their march to Caesar, had halted at the river. Archers from the Rutheni, and horse from the Gauls, with a long train of baggage, according to the Gallic custom of travelling, had arrived there; there were besides about six thousand people of all descriptions, with slaves and freed men. But there was no order, or regular discipline, as every one followed his own humour, and all travelled without apprehension, taking the same liberty as on former marches. There were several young noblemen, sons of senators, and of equestrian rank; there were ambassadors from several states; there were lieutenants of Caesar's. The river stopped them all. To attack them by surprise, Afranius set out in the beginning of the night, with all his cavalry and three legions, and sent the horse on before, to fall on them unawares; but the Gallic horse soon got themselves in readiness, and attacked them. Though but few, they withstood the vast number of the enemy, as long as they fought on equal terms: but when the legions began to approach, having lost a few men, they retreated to the next mountains. The delay occasioned by this battle was of great importance to the security of our men; for having gained time, they retired to the higher grounds. There were missing that day about two hundred bow-men, a few horse, and an inconsiderable number of servants and baggage.